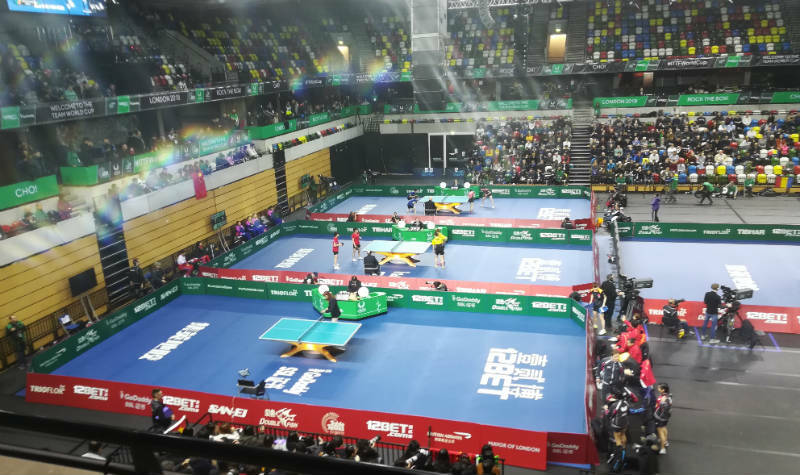 Last week, I went to the Quarter Final session of the Team World Cup in London. As a table tennis obsessive, this was heaven. A proper table tennis tournament, with the world’s best players, only a short train journey from where I live. I could write a gushing blog post about how amazing all the professional players are, but I don’t fancy doing that. We all know how amazing professional players are. No, instead, I thought I’d write some light-hearted ramblings about my experience. So stick with it. I’ll try and entertain you with my witty (this might be pushing it) table tennis anecdotes and observations. My first task when I got to the Copper Box Arena, was to make it past security. I had a backpack. This put me at risk. There is nothing which get’s a security guard more excited than a backpack. I walked in. Ticket scanned. And then the inevitable, “Sir! Sir! Please come here. I need to check your bag”. The security guard rushed towards me. I clearly looked a bit shifty. I was expecting a thorough examination of my bag and airport style questioning of my reason for existence. What? That was it? What kind of security check was that? If you’re going to make a fuss about checking my backpack, you may as well do a forensic inspection of all the scraps of paper, food crumbs and old socks lurking in the depths of my bag. As it turned out, he missed my bottle of water, which according to the pre-event information, I was prohibited from bringing into the Copper Box Arena. My next challenge was to find my Cambridge-Parkside TTC team-mates. There were no allocated seats, so I had to search high and low. I looked around the lower tier. No luck. I went to the upper tier. No luck. I went around the other side of the Copper Box. No luck. I temporarily got distracted by the equipment stalls and contemplated whether I should spend a lot of money on equipment I didn’t need. I then repeated the process. Lower tier. Upper tier. Lower tier. I tried to get into areas which were cordoned off. “Sorry Sir, you can’t come in here”. I eventually gave up and found a spare seat in the upper tier, where I could get a good view of all the matches. I sat there for a few minutes, enjoying the table tennis and scanning the arena looking for my team-mates. Then I noticed two familiar figures sitting in the seats right in front of me. My team-mates! How did I not notice them so close? I got a Quarter Final ticket so I could see lots of the world’s top players. This made sense when I booked the ticket. But of course, all of the matches took place at the same time. This was a real viewing challenge. I really wanted to watch the England match vs Brazil. I really wanted to watch 14-year-old Tomokazu Harimoto. I definitely had to watch Ma Long, Xu Xin and Fan Zhendong. And the France vs South Korea match was the closest and most exciting of all. I couldn’t focus. My eyes were darting this way, that way, left, right, up, down. I was trying to watch all four matches at once, meaning I wasn’t focusing on anything in particular. HOW CAN I WATCH EVERYTHING? IT’S IMPOSSIBLE! In the end I focused mainly on watching the Chinese play and then between points, switching to watch the England game. Every now and then my attention would be grabbed by an annoying 14-year-old screaming loudly. No. This was Japanese wonderkid Tomokazu Harimoto. He was the smallest competitor in the room and by far the loudest. Every time he won an important point, he would unleash a loud roar, as though he’d just won an Olympic gold medal. Serve. Receive. Third ball attack. ROOOOOAAAAAAAAAARRRRRR. I hope this doesn’t catch on. Table tennis will become unbearable if we all start roaring everytime we win a point. 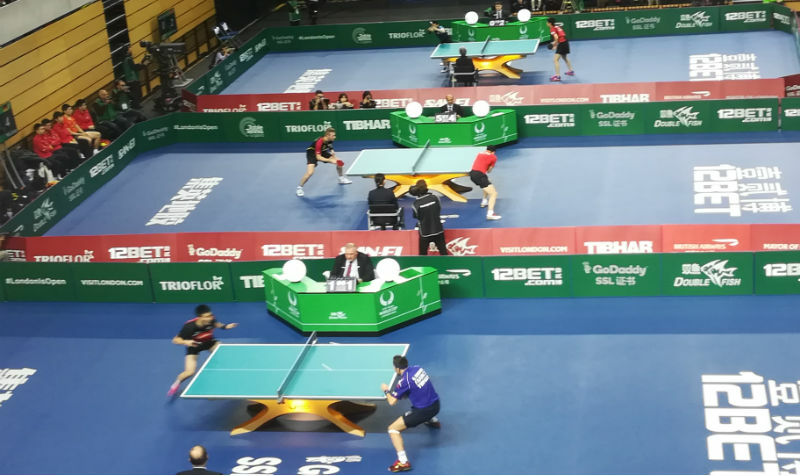 Maybe ITTF will introduce a new rule. Every point you win has to be followed by a roar. If you roar so loudly you annoy your opponent, you get an extra point. Whilst Harimoto’s roar is very noticeable, I think his backwards lean as he celebrates a point is even more impressive. How does he manage to lean back so far (see image above)? If I tried this, I’d pull or break something in my back. I think I’ll stick to my slightly camp and understated fist-pump celebration when I win an important point. Fan Zhendong is a phenomenal player. But his most impressive attribute is his legs. They are like tree trunks. Very muscly tree trunks. If he weren’t a table tennis player, he’d be a weightlifter. Or a WWE wrestler. Or the World’s Strongest Man. Compare his legs to Liam Pitchford in the image above. 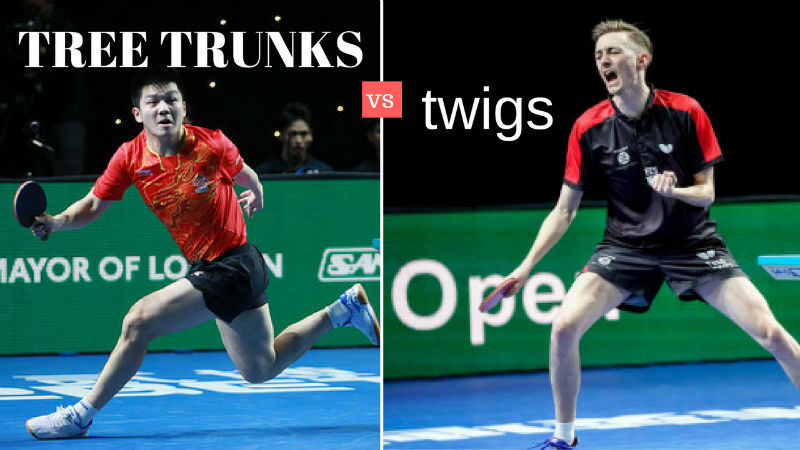 Fan Zhendong = tree trunks. Liam Pitchford actually gave Fan Zhendong a very good game in the Semi-Final and played pretty awesome throughout the tournament. This is reassuring. As a skinny legged man myself, Liam Pitchford gives me hope. You don’t need to have bulging leg muscles to be great at table tennis. Even skinny kids can play too. Thank you Liam. I raise a glass to your skinny legs. I’m as bad as the professionals! It was a real pleasure watching the top players. The footwork, the backhand flicks, the counter topspins back from the table – some of the play was phenomenal. But there was plenty of silly mistakes too, which is very reassuring. Even the professionals mess up too. In this respect, I’m like a professional player. Whatever they can do, I can do too (but far more frequently). Serve into the net? Yes, I can do that. Misread an opponent’s serve? That’s my speciality. Fall over whilst attempt to reach a wide ball? Did that just this week. Get confused by a chop-block? Every time. Miss an easy high ball? Heck yes! All day long. The professionals are human after all. Of course, I couldn’t resist leaving the Copper Box Arena without buying some new table tennis ‘stuff’. I got home around midnight. The house was quiet. The kids were fast asleep. Jodi (my better half) couldn’t be stirred. I had to wait until the morning to show off my new gear. Pfft. Midlife crisis? No way! 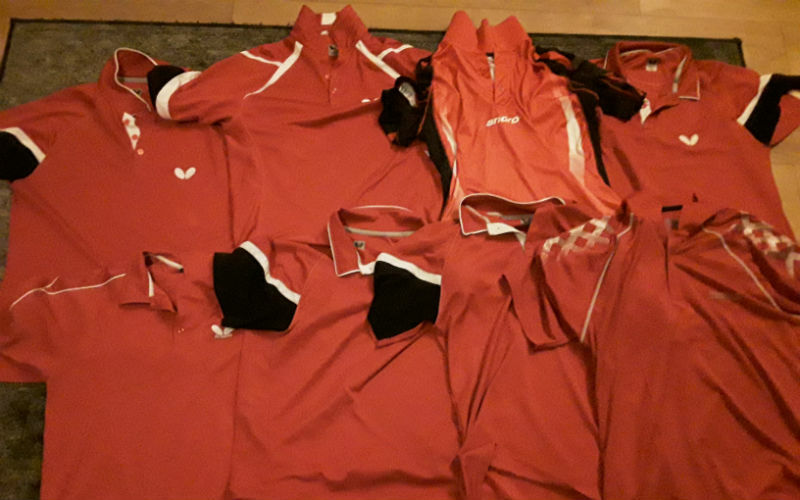 You can never have enough red table tennis t-shirts. With my latest addition, I now have 9. Maybe this is a bit odd. I, too went to the Copper Box Arena to see the finals China v Japan. The matches were absolutely brilliant. Unlike yourself there was only one match on at one time, so you could focus completely on the game in play. On a different note, I haven’t actually come across any player screaming during playing a match (thank goodness) but recently quite a few players have started to STAMP when playing a shot. I thought it was just when they were serving but no, I was mistaken, it was throughout the whole of the match. Why do players do this? It’s quite off-putting and unnecessarily noisy. Is this actually allowed during a match? You are actually allowed to stamp during the match, as long as it isn’t so over-the-top that it is unfairly distracting an opponent. Players may do this to disguise the spin more, so you can’t hear the contact. Best thing to do is just focus on your own game and try to block out other distractions. Very funny and very useful too!